Sashiko is a term for "needlework & stitching" but a Sashiko project requires more than just stitching. One of the small task (but not least important task) is cutting the thread nicely. A standard scissors can cut the thread without any major problems. However. a good tread clipper (we call it Grip Scissors) will improve the Sashiko experience. We carry a variety of Grip Scissors from entry level (mass-produced by machine) to hand-made (Hand-Sharpen) supreme grade. All made in Japan. 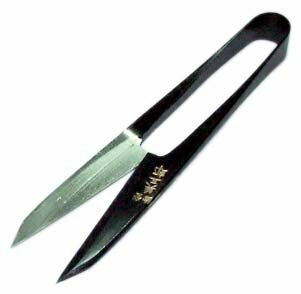 *Misuzu Scissors Company is a long-established scissor manufacture in Japan. We, as a group of Sashiko professionals, have been pleasantly using their grip scissors for more than a few decades. We strongly recommend to get the middle-range to high-end grip scissors instead of the entry models. Possibly the one over $25.00, or the one around $20.00. The entry model are good made, but the difference of user experience are not subtle. An entry level grip scissor with very reasonable price. Mass produced by machine with rust protection. 105mm short blade. Very popular Selection with Japanese traditional design with stripes. Made from Carbon Steel for knifes and scissors. 105mm. Short Blade / Long Blade. *A Long Blade one is currently out of stock | will be shipped from Japan. Clover is well-known craft supplier in Japan. We enjoy their scissors as well, and here is the scissors from them. More modern looking but the great sharpness. 105mm. Short Blade. Kamesaku is another brand we sincerely appreciate. Their selection is supreme, and they never disappoint us. A regular model of Kamesaku Brand. Although it is the regular model, the sharpness and quality is very much supreme and satisfactory. 105mm. Short Blade. Specially manufactured by the experienced artisans. It has better flexibility (snap) and sharpness. Supreme Quality. 105mm. Short Blade. Hand-made grip scissors from the experienced artisans. This is a master-piece of thread clipper you can get from the market. 105mm. Short Blade. We carry quite many selection of grip scissors for a Sashiko supplier. This shows how much I care about the thread clipper. I wanted to try everything before I introduce to my students / customers. If you would like to continue and be serious with Sashiko, I recommend you to get the one with above $20. Since you will be using it for a long time, it isn't an expensive investment. I do not know if one need a hand-made one for the regular usage. However, once you use the hand-sharpen one, you may not be back to the regular clippers, especially not to the entry level. If you would like to see how grip scissors works, the entry level one with less than $10.00 would just work fine. It is nice to have one of these in your craft box when you are in need of clipping the thread. The one in between $10.00 and $20.00 is good for both entry level and artisans. There are reasons they are sold in a big market. It is good and reasonable. Please feel free to contact me a question for more information. We mostly depend on one manufacture in Japan. Therefore, there is a change of our of stock items for a period of time. We try our best to keep items in stock in the USA or Japan. For those became out of stock in Japan, the item will be shipped out from Japan. The price include the $39.00 of shipping and handling fee. Since the scissors are made carefully by craftsmen, some order could take a period of time. We will update the estimate of delivery after talking to the craftsmen.